Regular readers of Guitarz will likely already know that of all the terrible guitar clichés, my absolute pet hate is skulls on guitars. 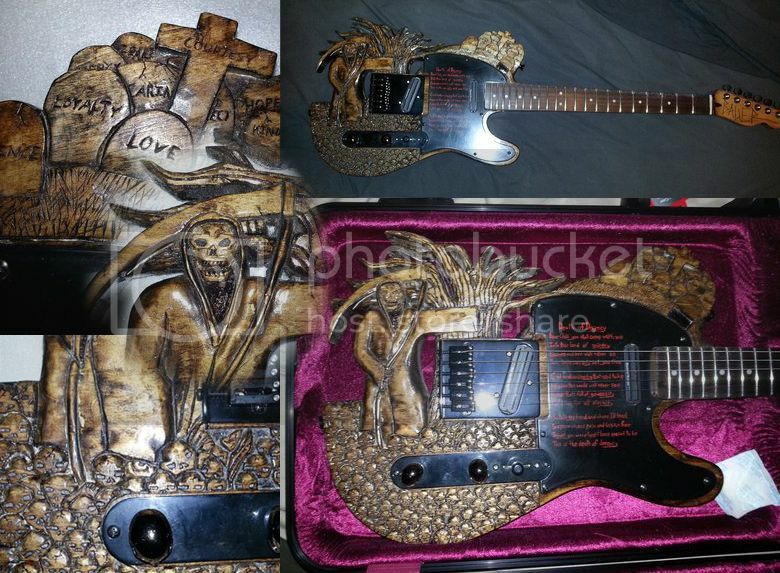 This hand-carved monstrosity from Bauer Guitars has hundreds of the bloody things, plus tombstones, and even the figure of Death himself with his scythe. I don't know what more I can say about this guitar. It's certainly not my kind of thing despite the artistry and many hours that must have gone into its creation; however I'm sure there are other folks out there who'll go mad for it. Currently listed on eBay with a Buy It Now price of $2,000 (I guess that's to reflect the time that went into making this piece but I think it's mightily optimistic). Starting bid: $666. How clever. Shame there's not a photo of just the headstock as the logo appears to be pure class, not to mention the font choice on the pickguard which is almost as cringe-worthy as comic sans. I haven't watched the video linked to in the description but somehow I know it will involve drop D tuning, a Line 6 amp and the guy's mum's basement. This is just god-awful. It's the guitar equivalent of a prison tattoo: bad idea, bad execution, just plain bad. I've just watched the video-I was mostly right! Except it appears to be the guy's mum's kitchen and not the basement. I particularly like the first picture in the video which shows the highly technical blueprint. It's not even neatly or artistically done! Absolutely horrible in every way. Craftsmanship, taste, etc. And, to top it all off, what a waste of a Telecaster. I don't think it's that horrific, as in craftsmanship. I've seen better but I seen much, much worse as well.